Can Tim Geithner Lead the Economy Out of Its Mess? Geithner's tax foibles probably won't derail his bid to replace Henry Paulson at Treasury. Republican and Democratic Senators, a number of whom have reiterated their support for Geithner in the past week, are likely to vote to confirm him as early as Thursday. Still, Hook and other tax experts say that if Geithner hopes to lower his April 15 bill in the future, he has some legitimate options  even if he lands the high-profile Treasury Secretary job. What follow are some filing tips for Geithner, as well as common tax traps he should avoid. 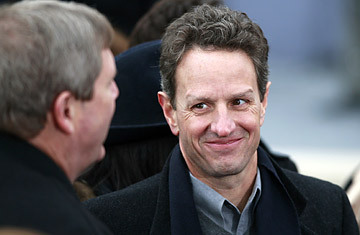 Geithner spent the past few years as head of the Federal Reserve Bank of New York and made nearly $398,000 in 2007. Hook estimates that before deductions Geithner could owe as much as $130,000 in federal and state taxes for 2008, assuming his income last year was the same. On top of that, he will owe nearly $19,000 in property taxes on his 3½-bedroom home in Larchmont, N.Y.  an upscale suburb north of Manhattan  where he lives with his wife and two children. Since Geithner certainly has an office at his Fed job, he can't claim his home as a place of business. But if he telecommuted, he could write off a portion of the cost of his computer and other gear needed to run the largest branch of our nation's bank from home. To get the deduction, though, Geithner, on the basis of his salary, would have had to spend at least $8,000 on home office equipment. But that shouldn't be too tough. If you are the head of the New York Fed, a 73-in. high-definition television ($3,000 and up) to watch CNBC is a legitimate business expense, right? The Secretary of Treasury job is not a position that finds you. Presumably, Geithner did some high-level networking and even flew out to Chicago a few times to meet with Obama in order to land the nomination  not to mention the trip to Washington for the confirmation grilling. Good news, Tim. According to Barbara Weltman, editor of the popular tax guide J.K. Lasser's Your Income Tax, all those trips are tax deductible. So we hope you saved your receipts. The IRS will let you write off a third of the amount of your job-search expenses as long as you land a job in your usual field. And since Geithner reportedly has held more than one meeting with current Treasury Secretary Paulson in the past year, it is safe to say he is staying in the same line of work. One thing to watch out for, Tim: expenses must be reasonable in the eyes of the IRS. So if you flew first-class to Chi-Town, you are probably going to be able to expense only a portion of your ticket. There's a catch in write-offs, however. Because of his high income, Geithner will most likely run afoul of the dreaded alternative minimum tax (AMT). Among other things, the AMT applies to people who would be able to use deductions to reduce a large portion of their federal income tax. The idea of the AMT is to make sure wealthier types pay their fair share. State income taxes and property taxes are federal-income-tax deductions. And since Geithner pays nearly $45,000 in those two taxes, he most certainly would be caught by the AMT. When you pay AMT, you can't take individual federal deductions. Still, he could use deductions to lower his state taxes, which at about $25,000 are pretty sizable. Mark Luscombe, principal tax analyst at CCH, a company based in Riverwoods, Ill., that provides tax information and software to accountants, points out that if you have to relocate because of your job, you can deduct a portion of your move. To qualify, your new commute would have to be 50 miles longer than it would be if you stayed in your current home. Since Geithner's place of work may be changing from lower Manhattan to Washington, he qualifies. And unlike the job-search deduction, moving expenses are not subject to the AMT. So don't go with one of those flat-fee moving services, Tim. On the basis of your current salary, taxpayers could pick up as much as 30% of your relocation costs. Geithner could also get a tax benefit when he sells his home. That's because he's not likely to get back the $1.6 million he paid for the house when he bought it in 2004. If he were to sell it today, Geithner's house would fetch $1,357,500, according to Zillow. Add in real estate agent fees, plus any money Geithner put into the house in remodeling and repair costs, and Geithner is probably looking at an investment loss of more than $300,000. He can use that to lower the taxes he may have to pay against long-term stock-market gains, if he is lucky enough to have any of those. But don't try to write the house off against regular income, Tim. If you do, the Senate might want to talk to you about it. Find out 10 things to do with your money.